DOWNBEAT magazine April 7, 1948 Herbie Fields! "Louis pops off on bop"! 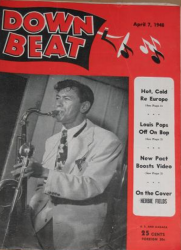 Featuring tenor player Herbie Fields on the cover, and Louis Armstrong's thoughts on BeBop with the headline article, Louis pops off on bop!, the April 7, 1948 issue of Downbeat magazine is a gem straight from the Swing Era. This issue of the quintessential Jazz and Pop magazine is chock full of surprising, fun and collectible stories straight from the era.